A landlocked nation between two giant neighbors, India and China, Nepal nonetheless stands apart with its distinctive, cultural heritage and natural climate with the Himalayas serving as an awe-inspiring backdrop. Despite the challenges that Nepal went through in the civil war at the turn of the 21st century, it has gradually started to stand up on its own, and has settled into its current role as a unique destination on the world travel map. 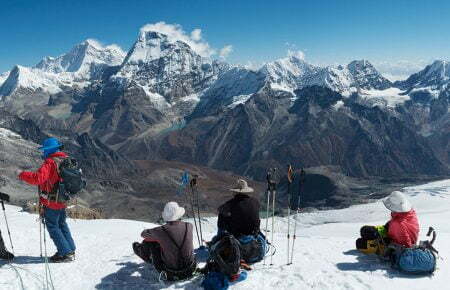 As the home of 8 of the world’s 10 highest mountains, Nepal attracts thousands of trekkers each year, adventurers anxious to traverse the high-altitude homelands of Sherpas, Gurungs and Tamangs. The lower hills have in turn become an adventure playground for climbers, kayakers, rafters and mountain bikers. But whether you are seeking for adventures or a more laid-back trip, Nepal has something for everyone. Other less-adventurous Nepalese attractions include palaces and temples with intricate wood carvings, sculptures and metalworks, pointing to the culmination of a rich and religious history, mighty forests, and riverine grasslands that have become the setting to some of Asia’s finest national parks. The combination of a majestic landscape and its unique culture makes Nepal a hidden treasure, like a pearl being carefully polished to perfection. Formed from the physical convergence of mountainous and jungle landscapes, the religious amalgamation of Hinduism and Buddhism, the merging of Tibeto-Burman and Indo-Aryan ethnicities, and the fusion of northern and southern architectural, artistic and culinary traditions, Nepal has many secrets waiting to be unearthed. Join an Indochina Pioneer Nepalese tour and discover the best of Nepal.